This really is the perfect chair. It looks exactly like it does in the picture and it arrived just a few days after I placed my order. I'm thrilled. Fusing classic European design with simple rustic charm. A distressed limed oak finish adds an antique touch to this Louis XVI style Medallion side chair. 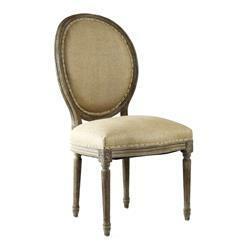 Upholstered in natural hemp, this traditional medallion chair lends elegance to a dining room.